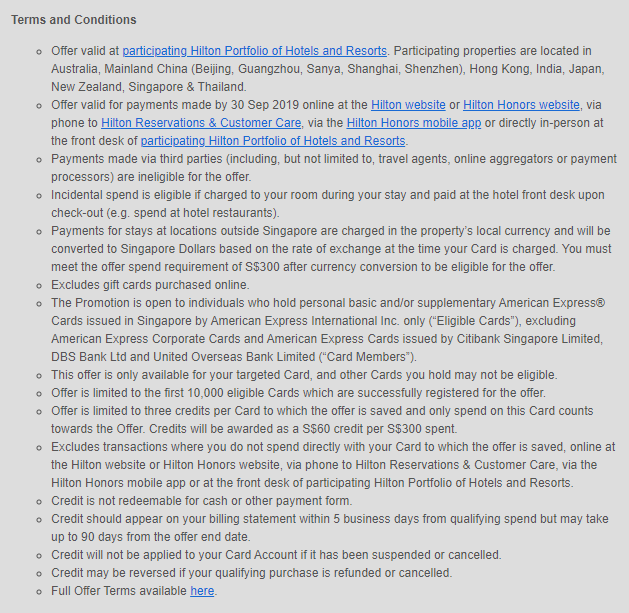 Spend by 30 Sept 2019 at eligible Hilton properties to get 40% (AMEX Platinum Charge) or 20% cashback (other AMEX cardholders). AMEX has just launched a very compelling offer for Hilton hotels. From now till 30 September 2019, register your card and spend at participating Hilton portfolio hotels to get up to 40% cashback on your stay. 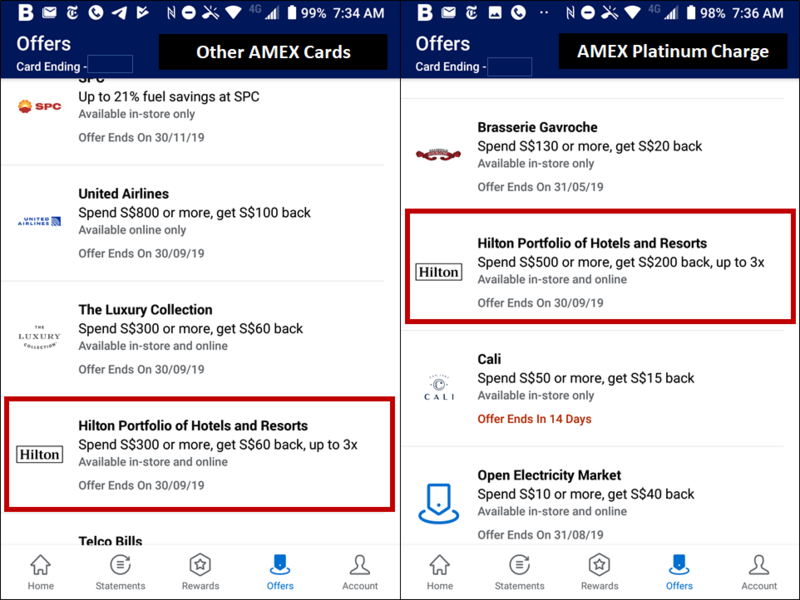 As the screenshot below shows, there are two different offers available: one for AMEX Platinum Charge cardholders, another for the rest of the AMEX portfolio (AMEX Platinum Credit Card, AMEX Platinum Reserve, AMEX KrisFlyer Credit Card, AMEX KrisFlyer Ascend). AMEX Platinum Charge cardholders need to spend at least S$500 in one or more transactions to get a S$200 statement credit. This can be done up to 3 times during the promotion period, and represents an effective rebate of 40%. This offer is available to the first 3,000 cardmembers who register via the AMEX app or through the AMEX dashboard online. Other AMEX cardholders need to spend at least S$300 in one or more transactions to get a S$60 statement credit. This can be done up to 3 times during the promotion period, and represents an effective rebate of 20%. This offer is available to the first 10,000 cardmembers who register via the AMEX app or through the AMEX dashboard online. Get approved for an AMEX KrisFlyer Ascend or AMEX KrisFlyer Credit Card by 15 May and win 10 prizes of 100,000 KrisFlyer miles each. More details here. After registering for the offer, you’ll need to make payment by 30 Sept 2019 through Hilton’s official channels (website, phone booking, mobile app) or directly in person at the front desk. Stays made through 3rd party channels like Hotels.com will not be eligible. You can view the list of participating properties here. 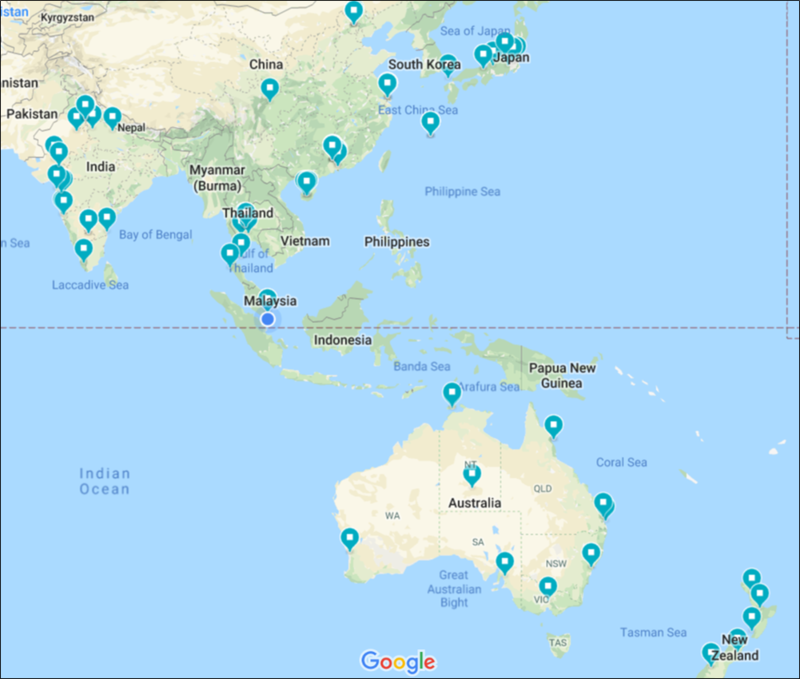 There are 97 in total, and I’ve taken the liberty of plotting them on this map so you can see at a glance what the geographical distribution is like. Remember that if you have a principal and supplementary card, each card will be able to register for the offer once. That’s to say, if I have a principal and supplementary AMEX Platinum Charge card, I’ll be able to enjoy the offer a collective six times. Here’s the full T&Cs for the spend S$300, get S$60 offer. The terms are mostly similar to the spend S$500 get S$200 offer. By using a cashback site like Ebates, you’ll be able to earn an additional rebate on your stay. That’s because you’ll still book through the Hilton website as per normal, and make your payment at the front desk or online, depending on the type of rate you book. 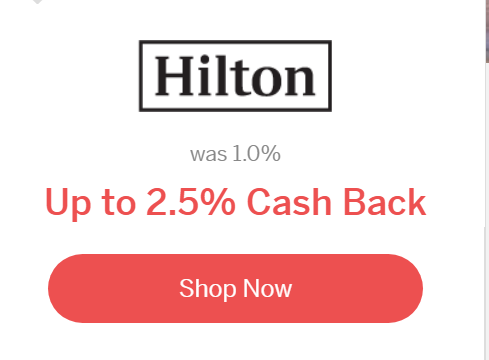 Ebates is currently offering 2.5% cashback on Hilton, which isn’t life-changing. However, there are periods where this rebate goes as high as 10%, so do keep an eye out if you intend to book an eligible Hilton hotel during this promotion period. The annoying thing is that Hilton tiers cashback by your membership level, and non-elite members actually earn more! It’s as if Hilton is pricing in the cost of offering elite benefits in to the kickbacks they offer cashback sites. If you’ve never used Ebates before, you can sign up using the link below and get a bonus US$10 cashback. For those of you chasing that Hilton Gold two stay fast track offer, this can help you substantially reduce your cost. I also like that it doesn’t require you to make the entire $300/$500 spend in a single transaction, so if you have a couple of smaller value stays planned there’s no need to consciously push up your spending. There are limited registrations available, and since registration is capped, I’d strongly urge you not to register more cards than you need. Let’s be considerate to each other so everyone can benefit from this great deal. Can I use this on hotel corporate rates too? Does it mean that i can accumulate for the SGD300, or must be spend in a single transaction to meet the SGD300? 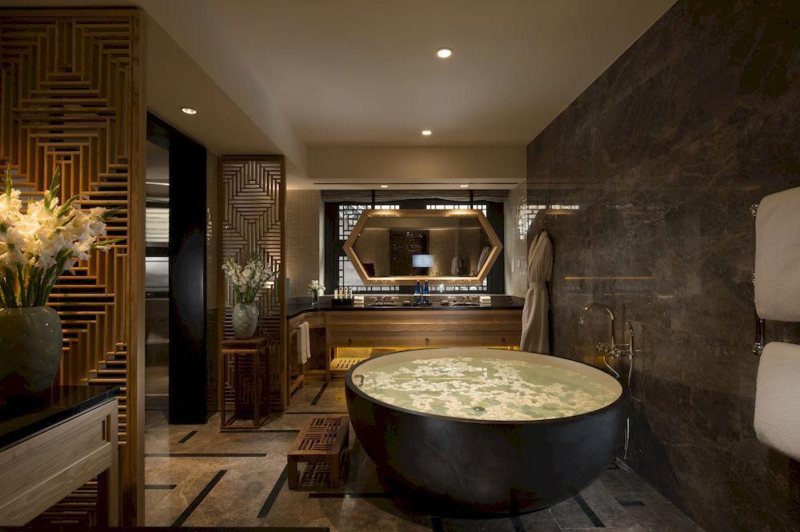 Are you going to write about the Luxury Collection hotel groups (e.g. Marriott) (also spend S$300 or more, get S$60 back on normal AMEX cards), and the offers on United Airlines (spend S$800 or more, get S$100 back)? LC.. on Amex Plat charge.. spend $300 get $90 back.. it’s just appeared at some point today cos I didn’t see it yesterday.. If you are Amex member, you can see it in the Amex app. 1. Have read some issues faced by users of cashback platforms (mainly Shopback) that they are unable to cash out the cash backs promised. Any issues you have faced cashing out with Ebates so far? 2. Was thinking of splitting a multi-day itinerary to maximise the cash backs (e.g. booking 6 nights at the same property as 6 different bookings). Will the hotel make us check out and/or change rooms every day? No issues cashing out with Ebates. Shopback- wasn’t the issue that they simply hadn’t received commission from merchant hence nothing to pay out? that’s more a tracking issue than a payout issue. Do you know if the spending is cumulative? Example for the Charge, if I spend $550 on the first transaction and $450 on a next transaction, can the “excess” 50 from the first transaction be added to the next 450 for a second rebate?